Kazuma Kiryu returns for the new PS3 Yakuza Project. Kazuma will be making a return as a playable character in the new game, thought to be shown off at this years TGS. 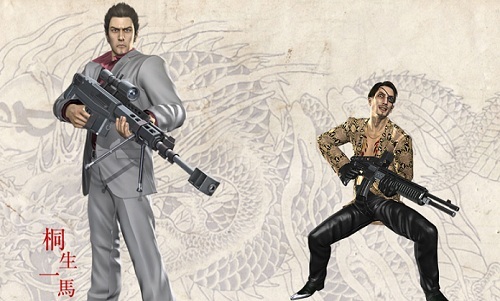 Similar to the Majima reveal, the character portrait of Kazuma illustrates him holding a large caliber Sniper Rifle, where Majima was also brandishing a shotgun in the previous image. I’d just assumed the weapon was something to characterize Majima and his wild attitude, but firearms may not be unique to him in the next installment. It may also have something to do with the concept of the game that was teased earlier in the month, suggesting that some parts of Yakuza that we’ve gotten used to in the years are likely to change. The differences between Yakuza and the spin-off Kenzan! were pretty interesting, with an emphasis on weapon forging and sword based combat without that pesky ‘durability’ to contend with, so anyone concerned that the developers might ruin something fundamentally enjoyable by tweaking the formula should lay their fears to rest for a moment. Personally I’m getting pretty excited to see just what this project turns out to be. Let the wild speculation begin!